Habitat, the Kickstarted space-physics #strategy game from 4gency, is now on Steam Early Access for $15 on PC, Mac and Linux, published by Versus Evil. This is the game that lets you fight with the Eiffel Tower in space. Nowwe all remember. In Habitat, players must use space debris to repair and build their ships, and to create homes for humanity to live in. 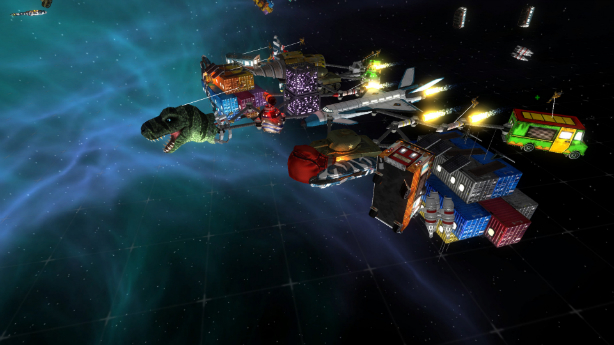 You’re able to create weapons and take out enemy space stations, and then salvage them for parts. It’s a blend of strategy, resource management, creativity and zero-gravity physics simulation. Habitat is in Early Access form at the moment, so it’s not yet feature complete, but the game currently allows players to manage their teams, fly around procedurally generated space, build ships and weapons out of 40 different items and connectors, and take on those evil space stations. Habitat raised $64,000 of a $50,000 goal on Kickstarter in May, and it’s due out in full on PC, Mac, Linux and Xbox One by the end of 2014. (Austin, TX) July 8, 2014 – Indie publisher Versus Evil, in partnership with Seattle based indie developer 4gency, today announced that Habitat: A Thousand Generations in Orbit is now available via Steam Early access. In Earth’s orbit, where crisis is guaranteed, Habitat is the only strategic space simulation game that uses orbital debris to build the future homes of humanity and where hope for survival relies on the creativity and resourcefulness of the player. Exploration, resource management and physics-based flight and combat come together for the ultimate space survival experience. Habitat: A Thousand Generations in Orbit’s Early Access build for PC, Mac and Linux is now available through Steam, Amazon, Humble Store, GameFly, Gamer’s Gate, GreenMan Gaming and Nuuvem priced at $14.99, £10.99 and €14.99. An additional value ‘buddy-code’ bundle, where gamers have the option of buying one code for themselves and one for their friend at a reduced rate, is also available for $19.99, £14.99 and €19.99. In the early access build, gamers will be able to explore a procedurally-generated orbital playing field and manage their engineers to build, rearrange and repair livable habitats created from the space junk they raid from a dozen or so space junkyards. They will also be able to test out and master physics-driven flight simulation using rocket physics, boosters and steerable thrusters to get around as well as experiment with lasers, grappling hooks and particle accelerators to turn their creations into deadly kinetic orbital weapons. Finally, they’ll be able to practice destroying and salvaging enemy space stations, taking on defense turrets and nanomachine hunters in a bid to survive! The Early Access version of Habitat is not feature complete and represents just a portion of what the final game will offer, both in terms of complete feature set and polish. In Habitat: A Thousand Generations in Orbit players assume the role of ‘Commander’ and lead a team of engineers to gather a variety of debris found in a procedurally–generated orbital playing field with a dozen space junkyards to raid and create livable habitats that can support human life Habitat’s sandbox environment provides a diverse and creative range of possibilities as players combine different elements of debris, explore space and mine the resources found there. A fully expandable tech tree can be researched to develop more elaborate space stations.